試做了這個藍莓芝士蛋糕, 很好吃。 不過賣相沒你的這麼漂亮, 餅底濕濕的, 然後芝士焗完冷卻後降得很扁, 沒你相片的厚, 不知道是不是我一焗完馬上拿出來令到溫度下降太快? 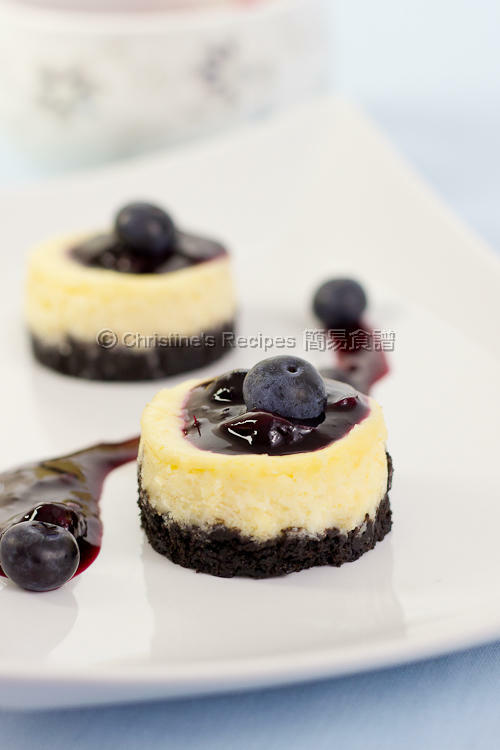 i couldn't find thickened cream in US...anything i can use to replace thickened cream? The thickened cream here in Australia is actually heavy cream with added gelatin. You might try using heavy whipping cream in US. Hello Christine, 我試做過幾次了, 每次都好好味, 女兒家人都很喜歡! 常叫我再做呢! 分享給其他 fans, 我在淘寶網買了 12 個 2" 的活動底小模, 脫模也很方便啊! 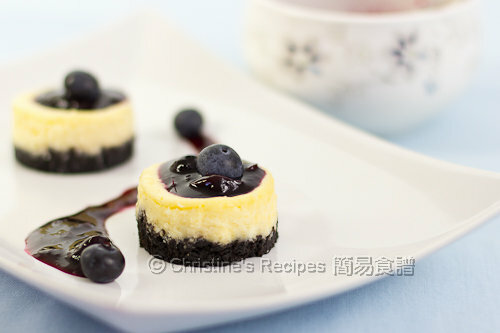 但每次做這個 cheese cake 都有一個問題, 就是餅底不夠結實 (我用消化餅), 是什麼原因呢? 我在想會不會是我塗了太多油於模上? I don't have a 12 mini cupcake pan, so I used a normal cake pan, but the cake did not get firmed after baking for 20 mins, so I baked it for another 10 mins, but still the center was still soft．And so I tried to put it in the fridge overnight before consuming, it's better but still it didn't get firm enough to cut it into a nice triangle, is it normal? And also the crust got stuck in the pan and not with the cake. Would you please tell me what could have gone wrong? The size of your cake was bigger, so the baking time should've been longer. 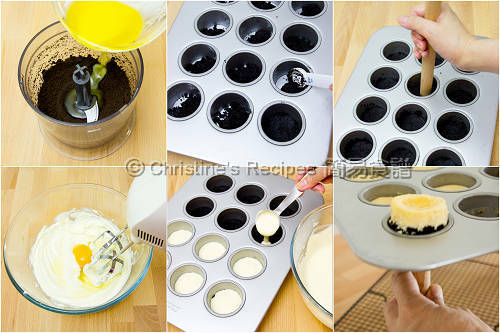 You might spray or grease some oil in your cake mould so that you can remove the cake easily.